One of the goals of orthodontic treatment is to achieve maxillary and mandibular midlines that are coincident- both with each other and with the facial midline (2). Coincident midlines serve both a functional (3) and an esthetic purpose (4-7). 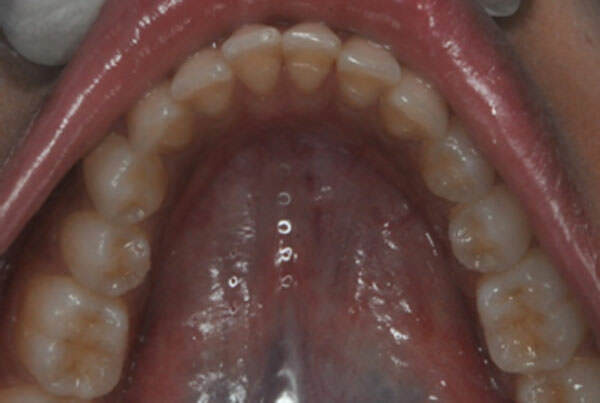 Coincident midlines are an important functional component of occlusion and can be used as a clinical guide in establishing good buccal interdigitation (3). 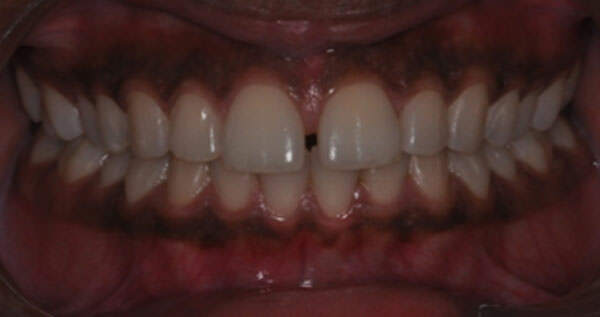 Esthetically, the midline is the most important focal spot in the smile (7). Esthetics in dentistry has increasingly become a major concern for patients and often serves as a primary reason for seeking dental care. Dental esthetics can affect not only facial but also social attractiveness (8). Shaw et al8 showed that persons with normal incisor relationships were viewed as being friendlier, popular, intelligent, and in a higher social class than those with an abnormal dental arrangement. Symmetry is an essential component in the perception of dental esthetics (9). Although perfect bilateral symmetry seldom exists in living organisms (10), it is one of the most important factors in defining the attractiveness of a smile (11). A properly placed midline contributes to the desirable effect of balance and harmony of the dental composition. 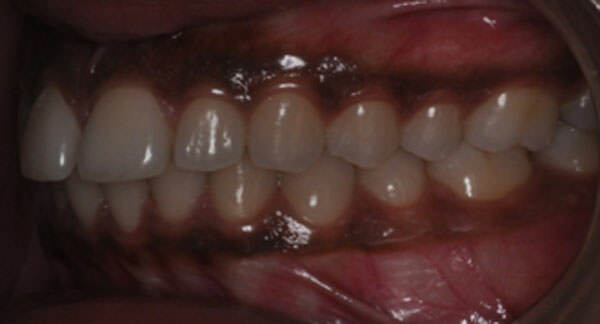 A 23-year-old female was referred to our department for orthodontic consultation. 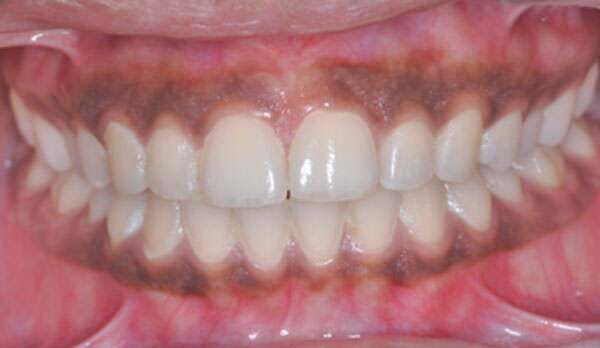 She had a well-balanced face, but her chief complaint was impaired esthetics due to a midline diastema in the maxillary arch. 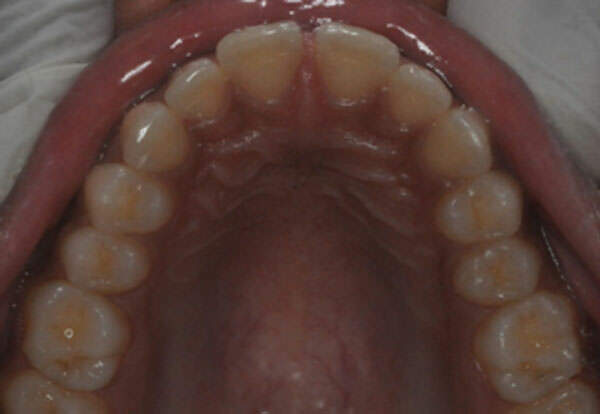 Intraorally, she had a Class I occlusion with a slightly increased overbite and a normal overjet. All teeth were present, maxillary right second premolar was lingually placed. Clinical examination revealed a mesencephalic head and mesoprosopic facial type, with a slightly concave profile and a low mandibular plane angle. The lips were competent, and the nasolabial angle was normal with no mentalis strain. In smiling, she demonstrated inadequate incisor exposure, a reverse arc, and a complete absence of buccal corridors. 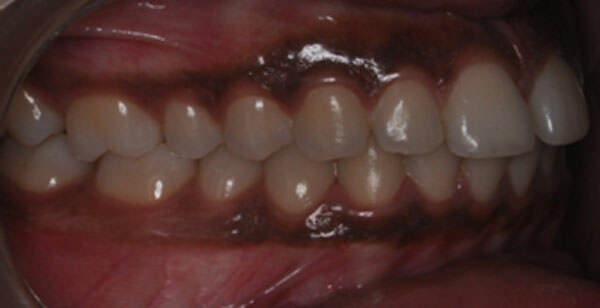 The unesthetic smile gave the patient an aged appearance. 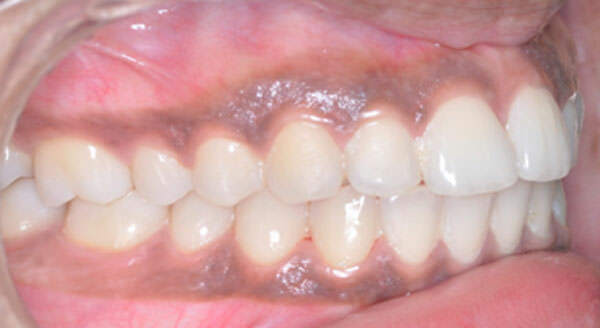 Correct the maxillary midline shift, obtain a normal overbite, and improve the appearance of the anterior teeth. The patient's maxillary arch was bonded using an indirect TARG (torque and angulation reference guide) set up with ORMCO .022 slot lingual appliances. Initial arch wires were and upper 0.0155 inch coaxial, and a lower 0.0155 inch coaxial. Followed by 0.016 inch Nitinol both upper and lower arches. After initial leveling of the upper and lower arch .019 x .025 stainless steel (SS) archwire was placed. The anterior six teeth were figure eighted together as were the posterior segments. A power thread and power chain were placed from the maxillary second premolars to the cuspids to supply the force the force for sliding mechanics used for en masse space closure. 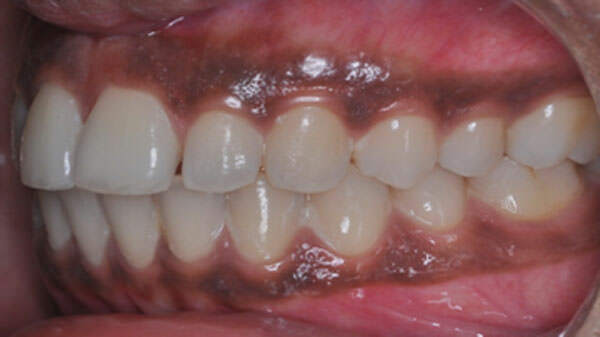 Lingual treatment has obvious advantages over labial treatment for the patient; no damage to labial or buccal surfaces of the teeth, no labial or buccal gingival hypertrophy or gingivitis, and better visualization of tooth alignment and facial contours (12). 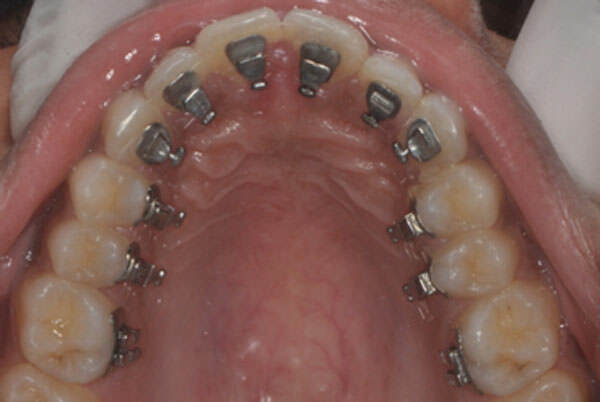 It has been shown that a lingual appliance can have the same capacity to align the teeth as a labial appliance. The mere lingual placement of labial brackets, tubes, and arch wires with minor modifications has not proved to be a satisfactory solution. Rather, the designing of a completely new appliance system has been necessary to meet the mechanical requirements inherent in the lingual environment (12). Chaushu S, Becker A, Chaushuc G. 2008 Lingual orthodontic treatment and absolute anchorage to correct an impacted maxillary canine in an adult. Am Journal of Orthod.2008;134:6. 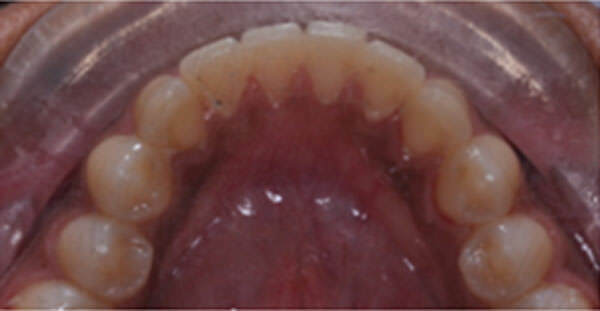 Thomas JL, Hayes C, Zawaideh S. 2003 The effect of axial midline angulation on dental esthetics. Angle Orthodontist.2003;73:4. Proffit WR, Fields HW. 2000 Contemporary Orthodontics. 3rd ed. St.Louis, Mo: Mosby Year Book; 2000, p 586-587. Beyer JW, Lindauer SJ. 1998 Evaluation of dental midline position. Semin Orthod. 1998;4:145-152. Johnston CD, Burden DJ, Stevenson MR. 1999 The influence of dental to facial midline discrepancies on dental attractiveness ratings. Eur J Orthod. 1999;21:517-522. Kokich VO Jr, Kiyak HA, Shapiro PA. 1999 Comparing the perceptionof dentists and lay people to altered dental esthetics. J Esthet Dent. 1999;11:211-324. Lombardi RE. 1973 The principles of visual perception and their clinical application to denture esthetics. J Prosthet Dent. 1973;29:358. Shaw WC, Rees G, Charles CR. 1985 The influence of dentofacial appearance on the social attractiveness of young adults. Am J Orthod. 1985;87:21-26. Gerber A. 1975 Creative and artistic tasks in complete prosthodontics. Quintessence Int. 1975;6:45-50. Bishara, SE, Burkey PS, Kharouf, JG. 1994 Dental and facial asymmetries: a review. Angle Orthod. 1994;64:89-98. Hulsey CM. 1970 An esthetic evaluation of lip-teeth relationships present in the smile. Am J Orthod. 1970;57:132-144.